The annual Northeast gala ceremony was held at The Westin Convention Center, Pittsburgh, PA, where hundreds of oil and gas executives gathered together to celebrate Operational Excellence, Innovations in technology, CSR, Health & Safety and Environmental Stewardship. 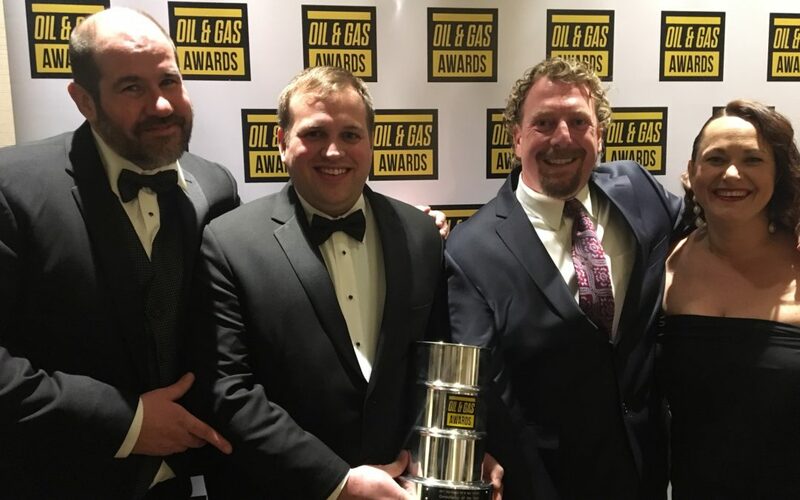 Midstream Company of the Year – MarkWest Energy Partners, L.P.
AllStar Ecology, a local West Virginia consulting company, humbly received the honor of Consultancy of the Year. AllStar Ecology is a specialty consulting firm focused on guiding their clients through the changing regulatory climate in regards to the Clean Water Act, Endangered Species Act, and the National Historic Preservation Act. They specialize in ecological and environment consulting and contracting, including surveying for federal and state protected species (bats, mussels, mammals, and plants), completing and implementing conservation plans, as well as mitigation banking, restoration contracting, and wetland and stream permitting (404/401) including mitigation banking and restoration contracting. Specific highlights for AllStar Ecology over the past year include manufacturing, installing, and monitoring over 300 artificial roosting structures to comply with the Endangered Species Act for endangered and threatened bat species in West Virginia. These structures had a 42% occupancy rate and included eight (8) northern long-eared bat maternity colonies, a federally threatened species. This success demonstrates how meaningful conservation measures can provide companies with a known and USFWS preferred solution for tree clearing activities while limiting cost and off-site conservation measure requirements. Moreover, in 2016, AllStar ecologists completed several freshwater mussel, and endangered plant species surveys required for oil and gas infrastructure development in West Virginia, Ohio, Pennsylvania, and Virginia. Since its founding, AllStar Ecology has surveyed over 50,000 acres of land, and permitted over 1,200 infrastructure projects in the region. They work directly with industry, as well as provide specialty as-needed support to engineering firms within the industry. AllStar Ecology is proud to be locally owned and operated with a staff of 40 professionally trained environmental consultants, 60% of which are West Virginia University graduates.